It feels like you guys haven't bothered improving this in a while. Could you please review how to make it better rather than letting it stagnate? High res screens like the Galaxy S4 show the graphs as tiny, as the graphs seem to be a fixed size in pixels. Adding a stock always results in an error message, but on refreshing, it's been added correctly. There seems to be no way to drag and drop the order of items, so their stock in the order they were added. You add stocks to a "portfolio", but it's just a list of tickers without the ability to even log stocks that you own, let alone integrate in with actual portfolio management tools. I know that a stock tool seems like it doesn't *need* to do much, but there are lots of opportunities to do things that will blow people away, especially considering it's a default app, so loss of people use it. If you have questions related to this or any other Google Group, visit the Help Center at http://support.google.com/a/google.com/bin/topic.py?topic=25838. Well, now I know why the app appears to be so neglected. 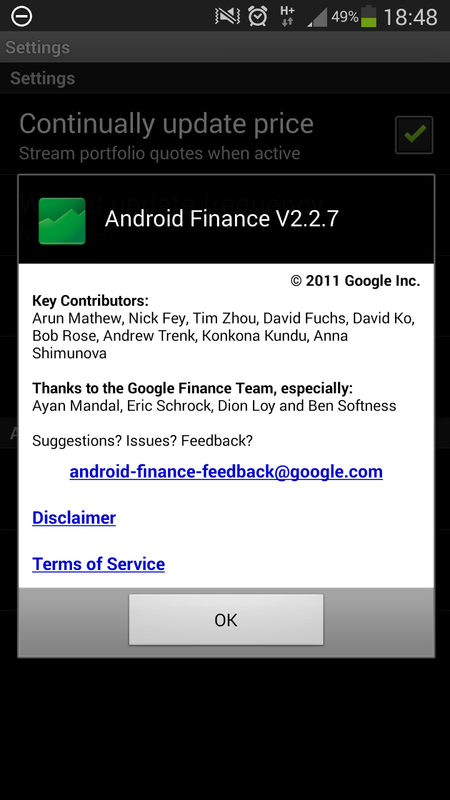 To the Android Finance developers... In memoriam. Yikes! Me too (11 March 2015) - same problem with feedback. So the Play Store allows you to install this junk and provides a feedback link that is invalid.